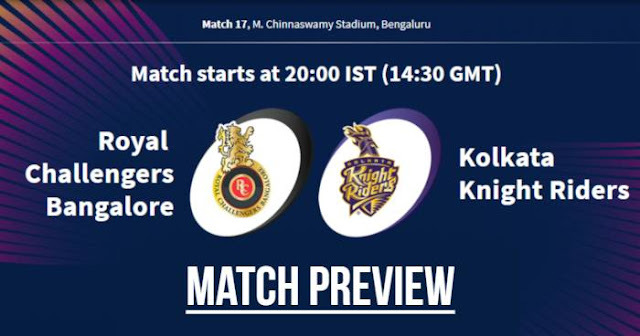 Royal Challengers Bangalore (RCB) will take on Kolkata Knight Riders (KKR) in the 17th game of the Indian Premier League - IPL 2019 on 5 April 2019 at M. Chinnaswamy Stadium, Bengaluru. As far as weather is concerned, the temperature will be below 30°C during the match hours and humidity above 40%. There is enough live grass on the wicket which suggests the ball will slide on. Occasionally, the ball might spin a little. It is a typical Chinnaswamy wicket which will have lots of runs. Sunil Narine missed the last match due to injury but according to sources is fit and ready to play and will be coming back in the place of Nikhil Naik. Kolkata Knight Riders (KKR) and Royal Challengers Bangalore (RCB) have met 22 times in the Indian Premier League (IPL); Kolkata Knight Riders had won 13 matches while Royal Challengers Bangalore has won 9 matches. In 2017 Kolkata Knight Riders won both matches against Royal Challengers Bangalore played in IPL 2017. Also, last season in IPL 2018 Kolkata Knight Riders won both matches. 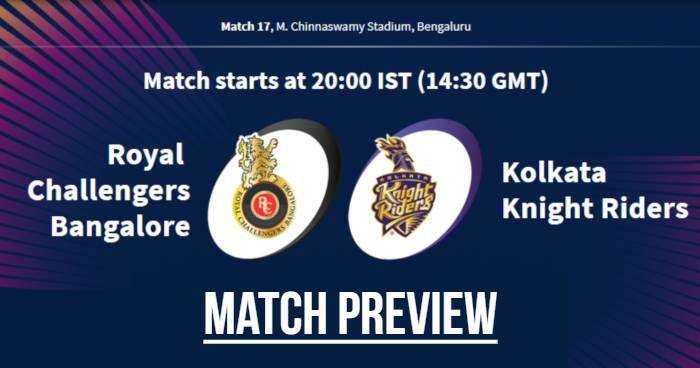 At M. Chinnaswamy Stadium, Bengaluru; Royal Challengers Bangalore and Kolkata Knight Riders have met 10 times out which Royal Challengers Bangalore won 4 rimes and Kolkata Knight Riders won 6 times. AB de Villiers average against Kolkata Knight Riders is his lowest against any IPL team. His average against KKR is 24.92. Royal Challengers Bangalore have taken only one wicket in the Powerplay in their first four games this season - the least among all the teams. 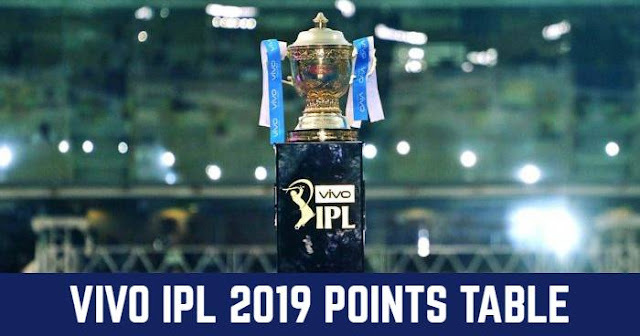 Kolkata Knight Riders have an economy rate of 9.27 in the three matches of IPL 2019 - poorest among all teams.